Linux is an operating system, or OS, for many platforms including servers and computers. An operating system is a core platform that manage all activities on a machine. It is what lurks beneath the hood and driving the machine forward, much like a car engine. Without an operating system, managing and merely interacting with a server would be significantly harder to do – especially since hardware is often built to utilize an OS to run efficiently. Linux hosting simply refers to websites hosted on servers running Linux. Linux is pronounced “lih-nix”. Ubuntu is pronounced “oo-boon-too”. Are you a beginner creating a personal blog or small business site would like to run it on WordPress or another CMS? Are you already familiar with, or have at least heard of, cPanel, WHM, and PHP? Do you want to have options in regards to what kind of software, script languages, etc. that you can use? Are you looking for Opensource solutions for your needs? Is integrating with various Windows or Office programs something you can live without? Are you looking for cheaper solutions for web hosting? If you answered yes to even two of these questions, Linux may be your preferred option for your hosting needs. Advanced Security: Linux is known for its robust, built-in security features. Basic Plans: Provides users with a variety of basic plans encompassing FTP access, Common Gateway Interface (CGI) scripting, MySQL services, email services, and SSH access. Fewer Bugs: Linux is known for its low susceptibility to virus and malware infestation. Simple Administration: Offers easy one-click software installation without using other software tools. Technical Support: Linux is known for its reliable technical support services, documentation, and online community. Less Expensive: Charges far less in terms of setup, software, and monthly operating costs. Linux is frequently less expensive because it is an open source platform with no licensing fees required to run it on a server (or a computer for that matter). This is an obvious reduction to overhead for hosting companies. Many hosting companies also support and invest in Linux. These investments have made Linux a very viable operating system and gives hosting providers an opportunity to focus their efforts on that one platform, greatly improving tech support and customer satisfaction. The Linux Foundation offers a certification program to help developers and admins become Linux experts, improving the user experience with highly trained IT staff. Linux and Windows are two different types of operating systems, and knowing the differences is important when choosing a web hosting plan. Linux and Windows use different script and database languages. If you know in advance you’ll need specific Windows or Office applications integrated with your site, Windows hosting may be an obvious choice. If you use PHP and MySQL for your website, Linux is the way to go. If your website using scripts like ASP.net, ASP, SQL or Access, Windows is your best bet. Which applications can I run on my server? What are the different distributions of this OS? How does the server treat file names? When it comes down to it, what does your website need? There’s a lot of information on the web about Linux hosting and how to use it. We’ve sorted through many of those resources for you. These helpful resources cover everything you need to get started with your Linux hosting pacakge. Getting Started: Learn More about Linux – Here you’ll have access to six other Linux hosting tutorials like creating an SSL certificate for your site and viewing and configuring Linux logs. Getting Started With Linux Shared Hosting (PDF) – This manual will explain how to set up your Linux hosting account, connect to a database, and everything in between. What’s the best Linux server for you? – This is an informative article that can help you decide which type of Linux server can best suit your needs. What is the LAMP Stack? (video) – Randy Hoyt gives a simple, easy to understand explanation of what a LAMP stack is and how it interacts with your Linux server. How To Make Your Linux Server More Secure – Those who are new to Linux can read this article to get some great tips on how to make sure your information is secure. 20 Linux Server Hardening Security Tips – This article details a multitude of ways that you can ensure the security of your Linux server. At the bottom of the article, there are links to other security tips and resources. CPanel is a Linux-based administrative control panel that offers an easy to use interface and automation tools. Below are a few handy resources to help you install and configure cPanel on your Linux hosting server. How to Install cPanel on Linux (video) – If you’re looking for a tutorial on how to install cPanel on a Linux server, this video will show you how. Getting Started Guide: cPanel for your Linux Server (pdf) – By downloading this PDF, you’ll have this useful “getting started” guide at your disposal. 5 Important cPanel Settings For Beginners – If you are new to cPanel, you’ll want to know about these five important cPanel settings. Linux Hosting (cPanel) Help – Do you need help with setting up your email, managing your files, installing applications, and troubleshooting FTP connections? You’ll find all that and more here. Getting Started with Linux Commands – This documentation gives a brief overview of some basic Linux commands that you might use as you manage your website or server. By far the most common question about Linux hosting is whether to opt for Linux or Windows technology. To help you make the right decision, we’ve created a list of resources with helpful advice and recommendations as to which choice better suits your needs. What is the Difference between Linux and Windows Hosting? – Knowing the differences between Linux and Windows will help you make the right choice when deciding on a host. 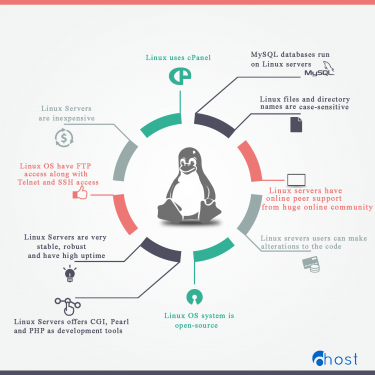 Five Reasons Linux Beats Windows for Servers – Linux is growing in popularity. Want to know why? Here are five reasons why Linux beats Windows for servers, according to PCWorld. Linux or Windows hosting? (video) – Still unsure? Check out this video to learn more about each option, how they work, and what to expect from both servers. Windows vs Linux (video) – This video offers a quick overview over some of the major differences between the Windows operating system and Linux based operating systems, with a little background info, too. Windows to Linux Migration Checklist (PDF) – Did you complete the hardware checklist? This PDF will make sure your Windows to Linux migration is successful. Good technical support is essential and not always easy to come by so you’ll want to bookmark these pages below. Linux Community Forums – Browse through the many topics covered in this forum to see if you can troubleshoot your issue with the help of the Linux community. How To Troubleshoot Common Site Issues on a Linux Server – Identify sources to common Linux problems and get great tips on how to resolve them in this excellent article. 14 Solutions to Common Problems – Presented in a “Q and A” format, this guide can answer your questions about what kind of programs can run on Linux, how to fix downloading issues, and more. 13 Linux Network Configuration and Troubleshooting Commands– Learn what troubleshooting commands like ifconfig, PING, ETHTOOL, and more, are and how you can use them to keep your server up and running. Server’s down: How do I find out what’s wrong? – This step-by-step guide is taken straight from the book, DevOps Troubleshooting: Linux Server Best Practices, and tells you how to manage your server and tackle any problems that you may come across. Linux Servers (pdf) – Paul Cobbaut created this book to help students and individuals learn the ins and outs of using a Linux server. You can learn how to troubleshoot any issues you may have with Apache, MySQL, DNS, and more.